Do you enjoy Bible Trivia? You have come to the right place! 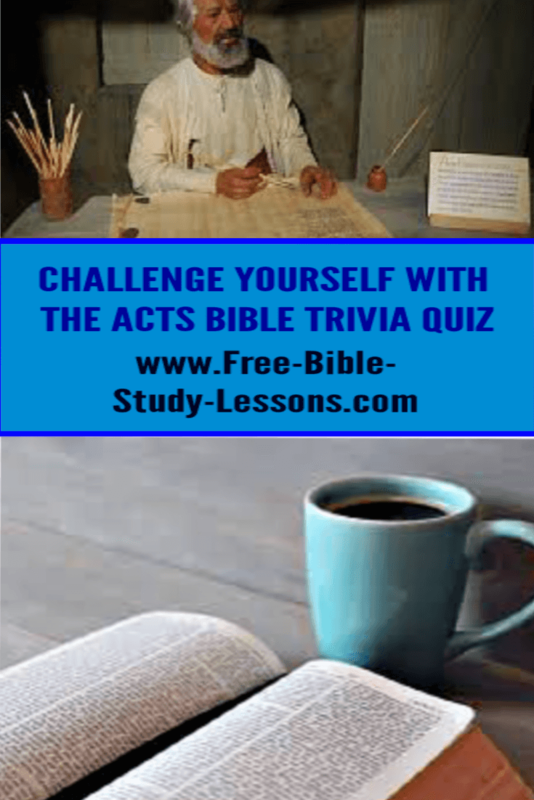 Launch into an exciting Treasure Hunt on Bible Trivia Acts. Studying and applying the Word of God is the most important thing we can do in life. On this page you can start an exciting treasure hunt through the Book of Acts. There are ten questions on this page. You must answer each question correctly and then follow the directions in the Password Decoder. This will give you the password to get to the next page. Each page has Ten Bible Trivia Acts questions, the password decoder and a selection of John Lord's History of Saint Paul. There are ten pages and then the final Treasure Page. Race your friends and prove you are the first one to the final Treasure page by solving the secret verse! 1. Correctly answer each Bible question. All the answers to these Bible questions are found in the Book Of Acts. You may use either the King James Version or the New International Version [pre-2011 version]. If you are using a different version and can't get the password to work, check out the reference in the KJV or NIV to see if they used a different word/spelling. 2. Make a note of each answer. If the answer is a number, write out the number, i.e. nine not 9. You make also want to make a note of the reference in case you need to double check your answers. 3. After you have all ten answers, go to the Password Decoder section and follow the instructions there. Write down each letter of the password in order until you have completed the password. Note: The password is not an actually word but a random list of lowercase letters - no spaces. You can work this out yourself or you can challenge your family, friends, youth group, or others, to a race to see who can get to the final Treasure Page first. On the Treasure Page is a Secret Verse [for which you will need your ten passwords to decode]. If you are challenging others, then the first one to decode this secret verse on the last page is the winner. Others can verify the correct answer when they reach the final page and decode the secret verse for themselves. 2. Peter and John healed the crippled man at the temple gate called _________________. 10. During the shipwreak the soldiers wanted to ______________ the prisoners. 5. Take the first letter from the fifth answer as the fifth letter in the password. 7. Take the fourth letter of the seventh answer as the seventh letter in the password. 9. Take the sixth letter from the ninth answer as the ninth letter of the password. 10. Take the first letter of the tenth answer as the tenth letter of the password. The Scriptures say but little of the life of Saul from the time he was a student, at the age of fifteen, at the feet of Gamaliel, one of the most learned rabbis of the Jewish Sanhedrim at Jerusalem, until he appeared at the martyrdom of Stephen, when about thirty years of age. Saul, as he was originally named, was born at Tarsus, a city of Cilicia, about the fourth year of our era. His father was a Jew, a pharisee, and a man of respectable social position. In some way not explained, he was able to transmit to his son the rights of Roman citizenship,--a valuable inheritance, as it proved. He took great pains in the education of his gifted son, who early gave promise of great talents and attainments in rabbinical lore, and who gained also some knowledge, although probably not a very deep one, of the Greek language and literature. Saul's great peculiarity as a young man was his extreme pharisaism,--devotion to the Jewish Law in all its minuteness of ceremonial rites. We gather from his own confessions that at that period, when he was engrossed in the study of the Jewish scriptures and religious institutions, he was narrow and intolerant, and zealous almost to fanaticism to perpetuate ritualistic conventionalities and the exclusiveness of his sect. He was austere and conscientious, but his conscience was unenlightened. He exhibited nothing of that large-hearted charity and breadth of mind for which he was afterward distinguished; he was in fact a bitter persecutor of those who professed the religion of Jesus, which he detested as an innovation. His morality being always irreproachable, and his character and zeal giving him great influence, he was sent to Damascus, with authority to bring to Jerusalem for trial or punishment those who had embraced the new faith. He is supposed to have been absent from Jerusalem during the ministry of our Lord, and probably never saw him who was despised and rejected of men. We are told that Saul, in the virulence of his persecuting spirit, consented to the death of Stephen, who was no ignorant Galilean, but a learned Hellenist; nor is there evidence that the bitter and relentless young pharisee was touched either by the eloquence or blameless life or terrible sufferings of the distinguished martyr. The next memorable event in the life of Saul--at that time probably a member of the Jewish Sanhedrim--was his conversion to Christianity, as sudden and unexpected as it was profound and lasting, while on his way to Damascus on the errand already mentioned. The sudden light from heaven which exceeded in brilliancy the torrid midday sun, the voice of Jesus which came to the trembling persecutor as he lay prostrate on the ground, the blindness which came upon him--all point to the supernatural; for he was no inquirer after truth like Luther and Augustine, but bent on a persistent course of cruel persecution. At once he is a changed man in his spirit, in his aims, in his entire attitude toward the followers of the Nazarene. The proud man becomes as docile and humble as a child; the intolerant zealot for the Law becomes broad and charitable; and only one purpose animates his whole subsequent life,--which is to spend his strength, amid perils and difficult labors, in defense of the doctrines he had spurned. His leading idea now is to preach salvation, not by pharisaical works by which no man can be justified, but by faith in the crucified one who was sent into the world to save it by new teachings and by his death upon the cross. He will go anywhere in his sublime enthusiasm, among Jews or among Gentiles, to plant the precious seeds of the new faith in every pagan city which he can reach. It is thought by Conybeare and Howson, Farrar and others that the new convert spent three years in retirement in Arabia, in profound meditation and communion with God, before the serious labors of his life began as a preacher and missionary. After his conversion it would seem that Saul preached the divinity of Christ with so much zeal that the Jews in Damascus were filled with wrath, and sought to take his life, and even guarded the gates of the city for fear that he might escape. The conspiracy being detected, the friends of Saul put him into a basket made of ropes, and let him down from a window in a house built upon the city wall, so that he escaped, and thereupon proceeded to Jerusalem to be endorsed as a Christian brother. He was especially desirous to see Peter, as the foremost man among the Christians, though James had greater dignity. Peter received him kindly, though not enthusiastically, for the remembrance of his relentless persecutions was still fresh in the minds of the Christians. It was impossible, however, that two such warmhearted, honest, and enthusiastic men should not love each other, when the common leading principle of their lives was mutually understood. Among the disciples, however, it was only Peter who took Saul cordially by the hand. The other leaders held aloof; not one so much as spoke to him. He was regarded with general mistrust; even James, the Lord's brother, the first bishop of Jerusalem, would hold no communion with him. At length Joseph, a Levite of Cyprus, afterward called Barnabas,--a man of large heart, who sold his possessions to give to the poor,--recognizing Saul's sincerity and superior talents, extended to him the right hand of fellowship, and later became his companion in the missionary journeys which he undertook. He used his great influence in removing the prejudices of the brethren, and Saul henceforth was admitted to their friendship and confidence. Part 2 on the next Treasure Page.